"Alan Smith, Dave Clark, Angus Sherring, Ray Smith, happy with their win!" The Dock Mooloolaba Australasian Etchells Championship wrapped up on Sunday 10 June, with seven potential winners from the 44 boat fleet, and just one race to sail for the seven race series. The intensity of the day was reflected in three attempts to get the race away, with the fleet eventually getting away with a clear start off a U Flag on a course set at 150 degrees with a 1.5 nautical mile upwind leg. Cruel Jane 1348 in first position by three points, and 1445 The Cure in second avoided one another in the pre-start. While both boats were most likely to win, there was no room for either to play with both having larger discards. John Bertrand and his team of Ben Lamb and Mark Bulka on 1440 Triad2 nailed the pin in the start that did get away and played the left-hand side of the course. The regatta leaders 1348 Cruel Jane, skippered by Simon Cooke with his team from Royal Akarana Yacht Club started midway down the line, while 1445 The Cure were ten boats down from the pin, and cleared their air to head out on port shortly after the start. Dangerzone, another NZ boat tacked on The Cure’s air which forced them back out to the left-hand side. Around the top mark Bertrand was just ahead of 1332 Top 40, skippered by Billy Merrington, with 870 Encore, Peter Conde in third. By the gate The Cure, who were in eighth around the top mark had moved through to fourth, and Cruel Jane to seventh from twelfth, both showing the speed and tactical strength reflective of their positions. There was a change to 140 degrees for the second beat, and John Bertrand and his team on 1440 Triad2 extended their lead by again heading out to the left hand side of the track. Bertrand maintained his lead around the top mark, with Top 40 still in second, which would result in third overall with the current placings, The Cure in third and in a leading position, and the regatta leaders on Cruel Jane in eighth, which would put them back to second overall. It really did come down to the final run. Bertrand and his team maintained their lead, and Merrington finished in second to take third overall. The team on board 1445 The Cure finished in third, and then all turned to wait eagerly to watch where the NZ team of Cruel Jane finished. They came home in sixth – which led to equal points, and The Cure skipper David Clark, Alan Smith, Angus Sherring, and owner Raymond Smith being named as The Dock Mooloolaba Etchells Australasian Champions for 2018. At The Dock Mooloolaba post racing, the prize giving was held with drinks and a great selection of food. The Brisbane Worlds organising committee spoke about the upcoming World Championship, and many people were thanked for their contribution to the regatta. You can watch the full presentation here. 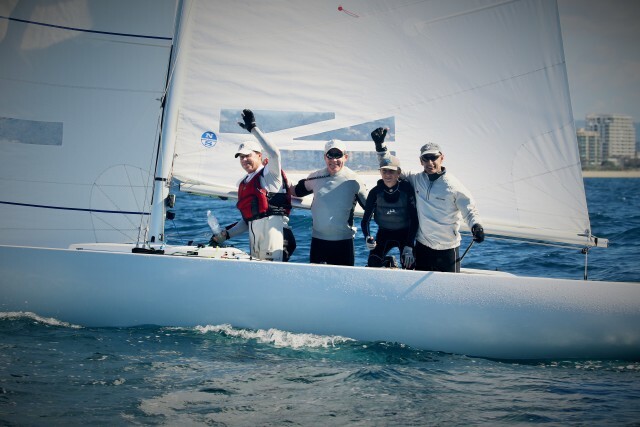 The lucky winner of the North Sails jib which was drawn from a pool of all regatta entrants minus the podium placegetters went to Steve O’Rourke and his team on Panther. Head to Adventures of a Sailor Girl to re-live the daily live coverage with guest commentators Michael “Cocko” Coxon from North Sails Australia, David “Chappo” Chapman and Josh Close, the Commodore of Mooloolaba Yacht Club.